In its move to collect maximum revenue by facilitating fair assessment of mobile phones at import stage, the government of Pakistan has just restructured regulatory duty on import value of mobile phones and introduced new flat rates for six different slabs. As of now, the regulatory duty on import of feature phones valuing up to $30 will be charged at a flat rate of Rs. 1,800 per set, which was previously only Rs. 250. Whereas, for the high-end smartphones valuing more than $500 per set, the import duty will be charged for a whopping Rs.18,500 per set. Though the step of the government is being portrayed as to lower the tax on budget smartphones and feature phones as compared to high-end phones, yet it’s quite obvious that the only purpose of the government is to generate maximum revenue. Previously mobile phones valuing up to $60 were charged with an import duty of Rs. 250. Whereas phones that cost between $60 to $130 were charged with an import duty of 20 percent and phones valuing more than $130 were charged with 20 percent regulatory duty on import in the country. Now after the restructuring of regulatory duty on mobile phones through the Finance Supplementary (Amendment) Bill 2018, mobile phones with an import value between $30 and $100 will be charged at the rate of Rs. 1,800 per set. Similarly, the regulatory duty on import of phones valuing between $100 and $200 will be Rs. 2,700. Meanwhile, the import value of mobile phones ranging from $200 to $350 per set will be charged with Rs. 3,600 regulatory duty per set. Moreover, the enormously raised regulatory duty affected the high-end and mid-range smartphone users the most. 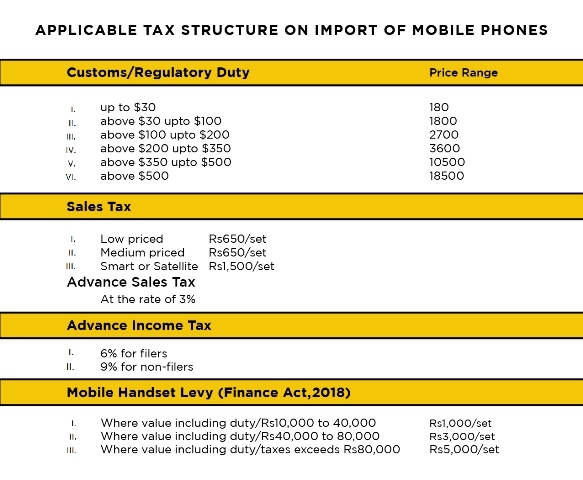 Mobile phone ranging between $350 and $500, will be charged with an import duty at a flat rate of Rs. 10,500, while the regulatory duty will be charged for a massive of Rs. 18,500 per set if a mobile phone has an import value of over $500. The imports of mobile phones in the country has already declined in the first six months of FY 2018-19. Importers are using identity theft to import phones without paying duties. To restrict this as well as smuggling of mobile phones, the government had introduced a new digital setup Device Identification, Registration and Blocking System (DIRBS). Nice move by the great Government. Oh wait we don't have anything local made in Pakistan. I remember once a member post about cotton tips made in china. We really appreciate the government doing something for the economy by decreasing the imports but these moron should first do something to make more localization rather than just closing down the imports. cell phones have become jewellry now, I dont see a problem in them being taxed. And I have a special hatred for "mobile malls" too. No point now in paying so much on a $500+ phone, so I support the tax increase for that category, especially in a scenario when our import bill is getting higher and higher. Smartphones have evolved a lot and these days the Chinese phonemakers (Huawei, Oppo, Vivo, Xiaomi and One plus) have improved so much that their products can be competed head to head with Samsung, Apple or any other phone maker in the world. Frankly speaking, the majority of people who buy more than $500 phone set just wanna show off (while the remaining ones are not aware that Chinese phones these days are not like the poor quality ones they used or heard about 3-4 years ago and their durability in some cases I've personallly witnessed is even higher that of Samsung / Apple). So it means we can bring Mi and Huawei phone for just 3600 rupees. Thats good duty price. Now it is manageable. But they should allow old phones like 1 year old or 2 year old as free. Because many people change there phone abroad and they don't visit pakistan each year. So it will be easy for them to bring old phone here. Which they don't want to sell as it is not worthy in international market.